This vibrant design will stand out from the crowd! With its colourful design and 100% chlorine resistant Endurance®+ fabric, this fun and vibrant swimsuit is ideal for swimming lessons, holidays, training sessions and race days. Pretty, soft and chlorine resistant fabric makes this suit perfect in and out of the pool This vibrant design will stand out from the crowd! 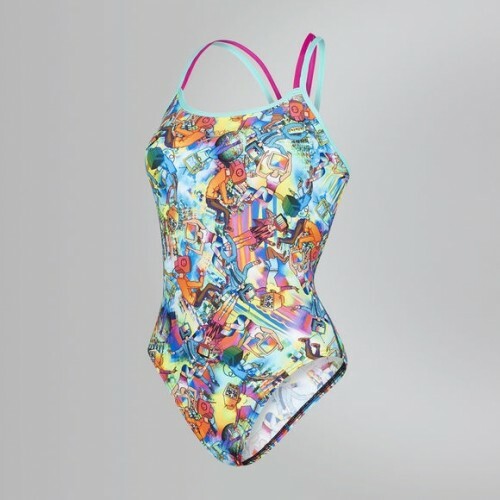 With its colourful design and 100% chlorine resistant Endurance®+ fabric, this fun and vibrant swimsuit is ideal for swimming lessons, holidays, training sessions and race days. Features and Benefits Double crossback design – For maximum movement and style 100% chlorine resistant, so your swimwear won’t degrade in the swimming pool. Freedom to move – 4 way stretch technology for comfort and softness. Endurance+ fabric retains its shape and resists fading longer than any other swim material.